This is my “everything” blog. Of course I read quite a bit, and love to write, but sometimes words overwhelm me. I need to take a break from the literary scene and do something different. Most of you know I paint in watercolors and oils. Not often, but the urge strikes now and then. It is messy and takes a lot of time. I also like to garden. Looking for a hobby? I have another hobby. I like to make jewelry. Years ago, I only wore fine jewelry and would dare not wear costume jewelry. Then I found the Bead Bar. It is a place in College Park that stocks drilled stones and gems like jasper and amethyst, turquoise and sterling silver, pearls and polished woods. I use a lot of lapis lazuli because it looks so nice with jeans, but it is increasingly hard to find. They also carry Swarovski crystal but I don’t use them much because they look fake, to me. I like to use things that look natural. They have classes at the Bead Bar. I learned pearl wrapping from a little Japanese girl and love the colors found in freshwater pearls. 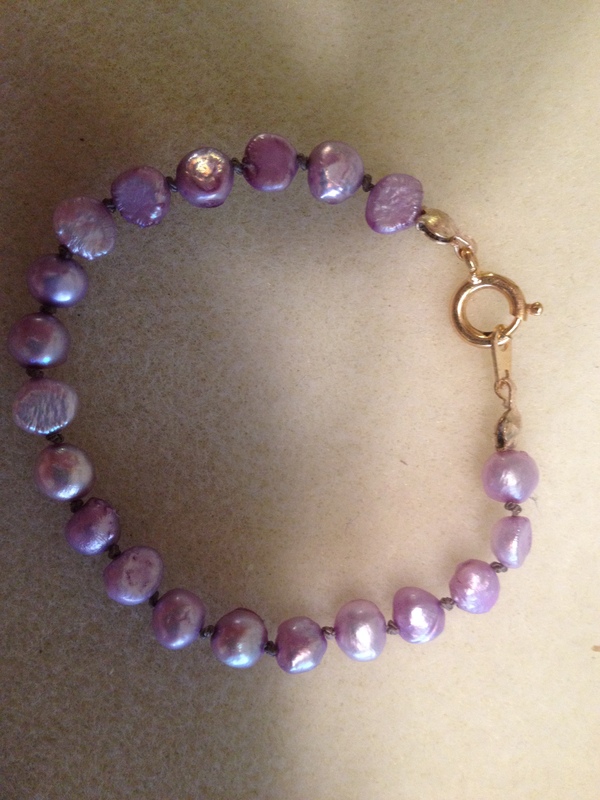 I made this tiny bracelet for my granddaughter for being such a good girl at the fall festival. She hasn’t seen it yet. Pearl knotting is the most durable as the wire-tipped silk thread they are strung and knotted on is strong. It is not difficult, but it is tedious and time-consuming. 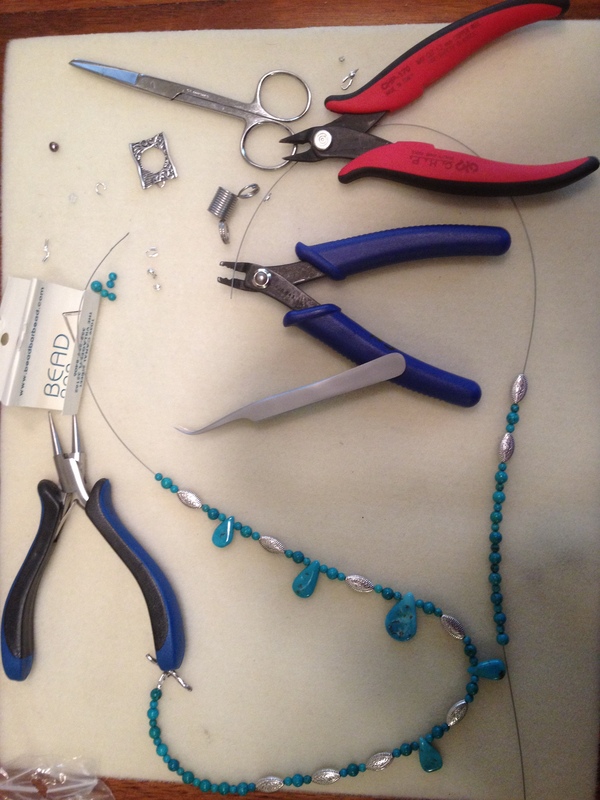 Wire wrapping is really hard and extremely time consuming. This technique was taught to me by the owner of the Bead Bar. She’s really good at it and crafts some truly special items. Mine are fairly basic. This hard wire is more durable than soft wire, has to be twisted and shaped with tools, but the connections are a bit clunky. These are made with polished woods. 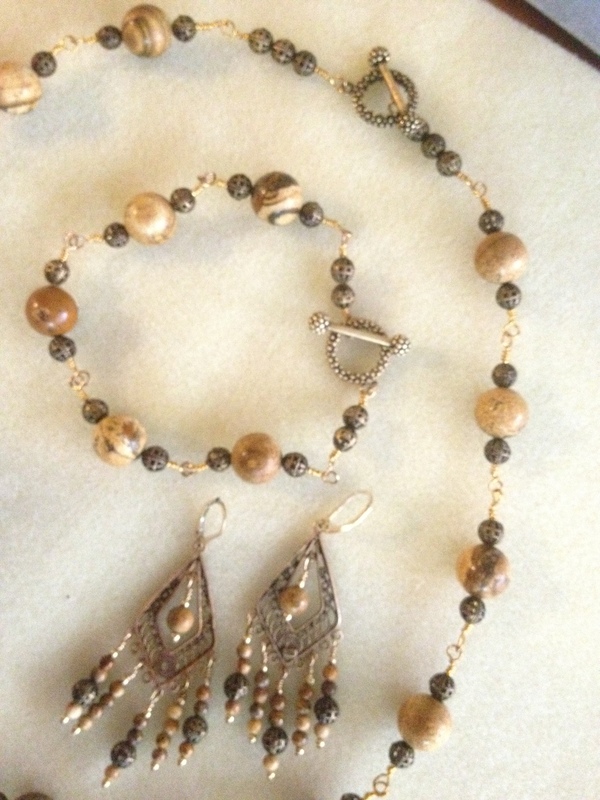 I love the long and dangling earrings. Woods are great for fall wardrobes. Here is the final product. 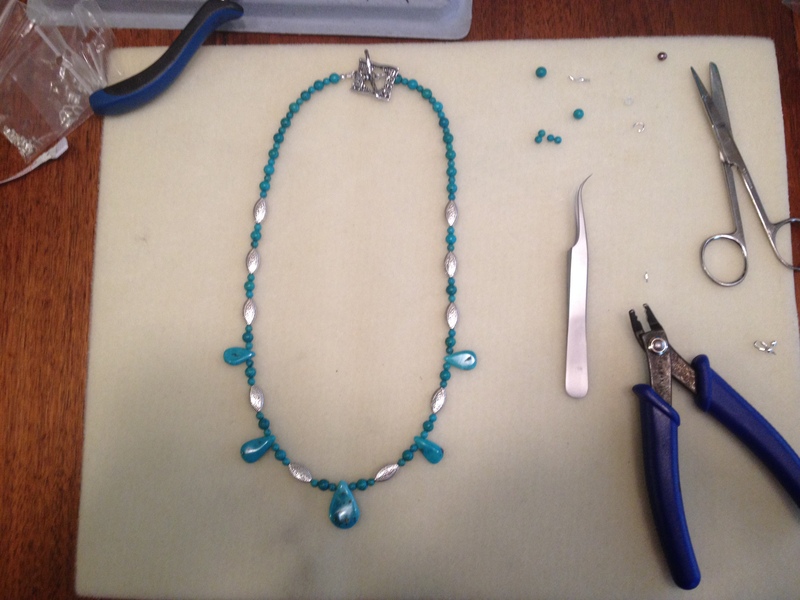 This is the easiest form of beading. Select your strings of beads, get a bit creative and string them up on the soft wire. This is the least durable as the wire tends to break at the crimp over time. It’s fairly easy to restring them, so not a problem if you can collect your beads. Kind of tough if a necklace breaks in the car. I don’t make a very good neck model, but this is how it hangs. I love turquoise with a coral-colored shirt. If you are looking for a hobby that will give you hours of joy and provides rather instant gratification (unlike writing), this is a fun one to have. I think I have an original piece of jewelry for every outfit I own now. 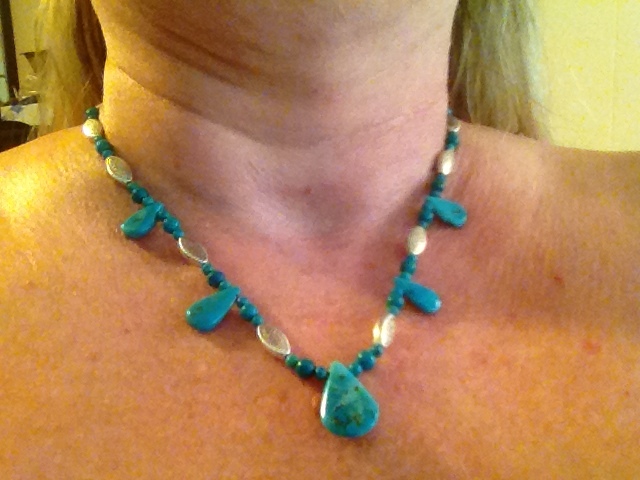 This one would have looked just as nice with three instead of five large pieces of turquoise. I get carried away. What do you do to take your mind off of work and relax? Do you enjoy artistic endeavors? People often ask me what I do when I am not writing. I paint, but I am a novice. Most of it I give away to people who express interest in it, family and friends. This is my latest, rather two dimensional, watercolor. The flow of paint on paper or canvas is relaxing. I paint in oils too, but it is messier and takes more time. I also make jewelry. It doesn’t look that great photographed without being on a model, IMO, maybe one day. It is odd how different it looks in sunlight compared to incandescent light. This last one was taken indoors. Most of the time my studio serves as a storage room. Sometimes I paint outdoors. I don’t care for the background wash in this painting honestly. Better luck next time. The Bird-of-Paradise that bloom all winter are gone now.